Where do I begin. Lofoten, a place that is pure magic, a destination that has recently been filling up my instagram feed, just a few hours South from where I live in Tromsø. Sky high peaks distend from the Norwegian Sea, their jagged edges and obscure shapes appear with every soft curve in the road. A series of islands and even smaller islands, with narrow one way bridges connect one piece of magic to another. Small secluded bays, beaches, surf spots, diving reefs, riding clubs, and fishing villages. Let’s not forget about water so still it could emulate glass. Perfect reflections make the peaks amplified, almost as if it was from another world. 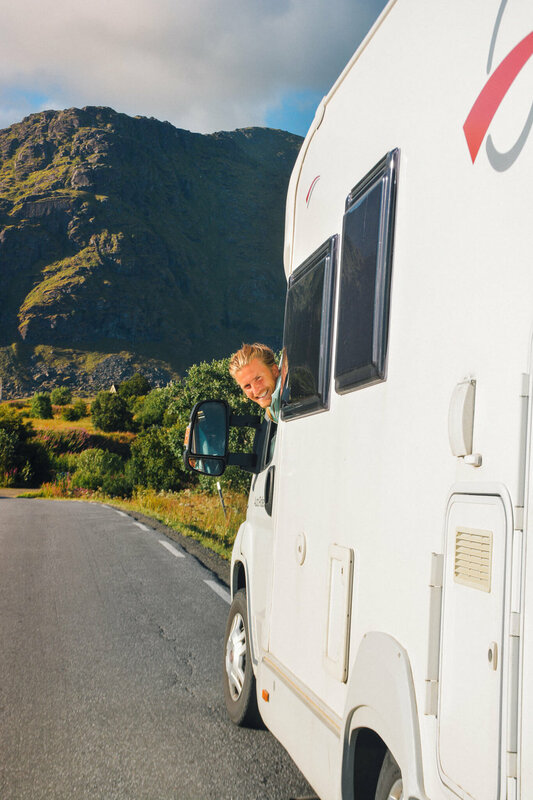 What better way to explore Lofoten than by RV. Full access to each nook and cranny of a place that feels so fresh and free. Waking up in a bay, breakfast on the beach and lunch on top of a mountain. With 48 hours to explore, where do we even begin? For once, I attempted to do some research (the night before) and it was like going to a candy store, which city do we choose? What activity do we pick? Which mountain do we climb? With endless options, I thought it would make the most sense to hike, do a ‘local activity’ and perhaps another hike. I narrowed it down to Ryten, a 543 meter hike with stunning views of a secluded white sand beach (a recommendation by Norwegian native, Camilla), surfing at Unstad (where Chris Burkard has taken some gnarly photos surfing under the midnight sun), diving in the arctic seas, along with a few other key stops along the way. 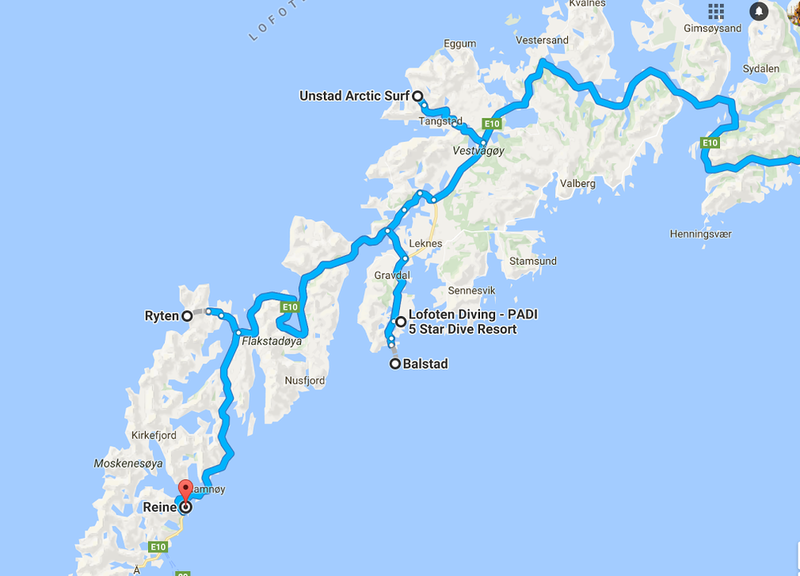 I took the 100 bus from Tromsø to Narvik, a 4 hour journey, through immense forests and fjords. It was so stunning it was almost distracting. 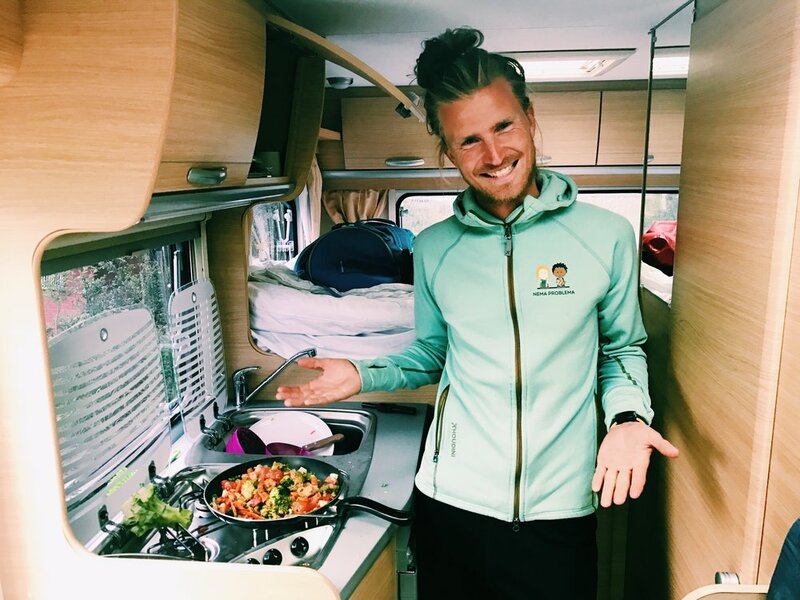 After getting off in Bjrevik, I met Robert who had showed up in a classic RV, equipped with a double bed, kitchenette, a bathroom and even 2 lawn chairs. Classy. I was instantly obsessed with this way of travel. I had the preconceived notion that RV travel was for old people who were bored and somewhat lazy, I was quite wrong. This RV gave us the freedom to be anywhere, wake up in a secluded bay or deep in the forest. It was spectacular. With the sun shining we set the GPS to Ryten, one of the southernmost points of Lofoten in order to hike just before the sunset. We stocked up on groceries and was on our way. I must have said WOW over 100 times within the next 3 hours, because frankly I did not have any other words to describe the beauty of Lofoten. It was next level. We finally got to the base of Ryten, and made our way up. The grass was soaking to say the least, but we made it to the top in 1 hour and 5 minutes (the suggested time said around 1.5-2 hours). The view was something out of a dream, and it was almost hard to believe untouched places like this still exist on our planet. After a few photos, and drone flying, we ran down as it was getting rather chilly. We decided to drive towards Unstad to set up camp for the night, the sunset was absolutely stunning and seemingly lasted for hours. Around midnight we found a small cozy bay next to Unstad. We put the RV in park and decided to make a late night veggie dinner. We got into bed and woke up to sunshine peaking through the windows. How magical. The next day, we planned on surfing at Unstad, which was a very impressive establishment. The facilities are very modern, cool and relaxed (classic surf camp). We booked a spot for noon, so we drove the RV down to the shore with the fellow surf bums. We sat in the sun (in our oh so classic lounge chairs) while listening to the faint sound of the ocean in the distance because there were no waves. I read The Escapist by Monocle, and when noon rolled around so did the clouds, but the waves didn’t show. We decided to bail on our surfing plans and head northeast to find a mountain to hike and a cozy road side stop to cook lunch. Once it started to rain, it did not seem to stop. We made a pitstop on the side of the road next to a white sand beach to cook lunch and have a little nap. Svolvær, one of the largest cities in Lofoten was coming up so we decided to stop there to hike up a mountain that was pure rock and mud, and for someone clumsy like me, probably not the best idea. We attempted and after about 100 vertical meters we went down for a stroll around a nearby lake. Later in the evening we found a secluded place to sleep near the sea, close to where I could get the bus in the morning and Robert could drive the RV back to Sweden. Breakfast was spent working, and then just like that we were back near Narvik and I was getting dropped off in the same place I got picked up just 2 days before. Such a magical ‘city-break’ to the mountains of Lofoten, one of the most beautiful places I have ever been to. Overall, the trip was a 10/10 for the freedom, beauty and endless possibilities Lofoten has to offer, and of course the company could not get any better. PS everyone needs to travel by RV before they are 60, it’s amazing.